Wooden Chest Box | Mahogany Red with Velvet Interior(WAL-006) - Keywood International Inc. This wooden canteen chest box is magnificently crafted with mahogany exterior, outlining the elegance of cutlery. Velvet interior construction prevents cutlery from damages and stores it away from water and dust. 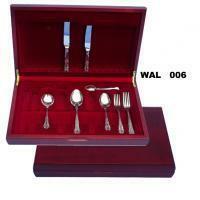 Also ideal for display and showcasing your cutlery masterpieces. Can be designed for fitting 30, 60, 72, 84, 96, 112, 131 pieces, etc.